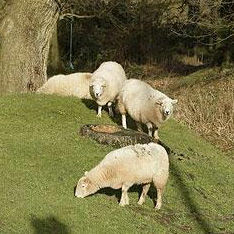 Forest of Dean Sheep are a bit like Marmite – you either love them or hate them. Before Foot and Mouth when all the Forest sheep were burnt on Pyres I never had much affection for the wooley things I have to admit. But after this horrific event, the Forest seemed so empty without them and as they gradually returned to graze I started to have some respect and attraction for the little blighters as they all seem to have different characters. Now every morning driving on my way to work, I try and spot my “sheep of the day”. This morning it was a sheep laid by the side of the road against the bank, hardly lifting his head to eat the juicy grass. He looked like the happiest and most contented sheep ever, munching away. I think I will call him Dylan as he reminded me of Dylan from the Magic Roundabout (O gosh I’m showing my age). I am expecting to see him on my way back home twice the size where he has just been sat in the same place all day without moving. Alright for some eh?. Perhaps our company logo should be a sheep rather than a star – but I suppose that would make us office sheep rather than office star and that would just be weird? They are definately an integral part of the Forest of Dean, unlike the wild Boar – but thats another subject. You can leave comments by clicking here, leave a trackback at http://news.officestar-group.co.uk/index.php/forest-of-dean-sheep/trackback/ or subscibe to the RSS Comments Feed for this post.